Is it me, or have UK distributor Shameless wandered a little from their original, self-set brief? Back on their launch in October 2007, their own press release assured us that they would be delivering "carefully picked vile, evil, gore-soaked, demented, disturbing, deranged, naked flesh-filled, flesh-ripping, depraved, tormenting movies that will delight horror and exploitation fans." And indeed they have, many times over. But go into their latest release Footprints [Le orme] salivating for any of that lot and you're in for a serious let-down. This is not a horror movie. It's not even an exploitation movie in the sense we've come to know it. No sir, Footprints is a low key mystery with nary a hint of bloody violence and one that requires its audience to show a little patience to fully reap its rewards. Not one I'd usually review, then. But I'm as keen to have my intellect tickled as I am to be visually startled, and have a serious soft spot for any film that still has you wondering what the hell is going on halfway through its running time. And Footprints certainly does that. It all starts with the sequence that runs under opening credits. What looks like one of NASA's lunar modules lands on the moon, but the small step taken by one of its occupants is used to drag his dazed companion onto the lunar surface, plonk him there and take off without him. So this is a science fiction thriller, huh? Nope. Next we're introduced to respectable-looking translator Alice, who is strangely captivated by the image on torn-up postcard she finds on her kitchen floor. She confides to a friend that she's been having a recurring dream about the above detailed moon incident, which was inspired by a film that rattled her so much a few years back that she walked out before the end. The dreams certainly play like a film, particularly when this lunar abandonment is revealed to be some sort of perverse experiment overseen by a barking official named Blackmann. Wait a minute, isn't that Klaus Kinski...? Alice's real problems don't start until she gets to work and is taken to task by her boss for abandoning her post for three days. She's understandably confused, since she distinctly remembers coming into work yesterday. But a quick look at the office calendar confirms that her yesterday was in fact three days ago and she has no recollection of what happened in the intervening period. The oddities continue back at her apartment, where she can't find her grey suit or one of her earrings, but discovers instead a yellow dress that she doesn't recognise but which fits her like a...erm...glove. With only a faded memory of a place name, a hotel and a particular stained glass window, she sets off for the seaside town of Garma in search of her missing days. Footsteps is all about the mystery and I do mean all. Everything Alice does, every encounter she has and every place she visits is in search of answers to her conundrum. This does mean that there's precious little variance in tone or pace throughout the film, and if you're not hooked by the setup then you're likely to be bored silly by the halfway mark. 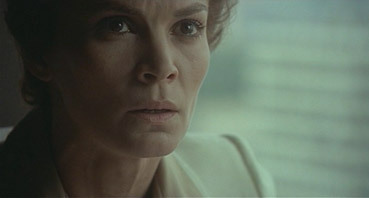 But if you do buy in then the intrigue is likely to last, aided by solid central performance from Brazilian actress Florinda Bolkan (who intermittently reminded me of Lindsay Crouse in David Mamet's House of Games) and the tangible air of unease built by the directors' canny way with camera placement and slow creep tracking shots. Whether the explanation lives up to expectations is another matter entirely, being plausible and interesting rather than the fiendishly clever reveal demanded by such a build-up. But it's well enough done to sidestep major irritation and scores points for letting us interpret the reality behind Alice's visions rather than laying it out on a plate. An earth-shattering rediscovery Footsteps may not be, but it's still smartly made and involving enough to suggest that Shameless have not so much strayed from their original intentions as expanded on them. And I, for one, see nothing wrong with that. According to the pre-release cover artwork, Footprints has received an 18 classification, and having watched the whole thing twice I was at a loss to work out why. A quick check on the BBFC's web site reveals that it was actually awarded a 12 certificate, which suggests that the higher rating is not for the main feature, but the sizeable collection of trailers for other Shameless releases you'll find in the extras. I'm not suggesting any deliberate attempt to mislead, but can't help thinking that Shameless didn't lose much sleep on seeing that family rating bumped up to adult movie status. 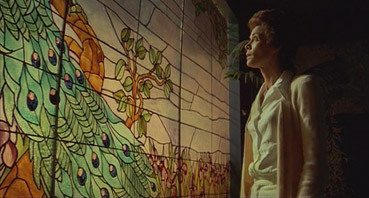 As with a number of previous Shameless restorations, the cut here has been assembled from more than one print, with the missing material from the English language version patched up with footage from a lower quality Italian original, which accounts for the occasional switch to Italian dialogue and the sudden appearance of English subtitles, sometimes midway through a shot. If you've selected the Italian track then the restored sequences are still easily identifiable by the temporary drop in picture quality. On the whole the transfer is good, in spite of some intermittent stability issues that prompt the image to wobble a bit in the early stages. The colours are a little faded but the contrast is decent enough, though black levels are rarely completely solid and occasionally drift into grey. The sharpness varies, but on the best material is impressive. The mono 2.0 soundtrack is as range restricted as you might expect, with the added bonus of some background hiss and the odd beep of noise. It's perfectly serviceable, though, and you soon forget about these small defects. You have the choice of watching the film with English or Italian language tracks, with optional English subtitles for either. Logically you'd expect the Italian track to be the original and the English track a dub for the foreign market – it is an Italian film, after all – but that's not the case here. Switch between the two and it's clear that most of the dialogue was actually delivered in English, and thus it's the Italian track that's the dub. If you do go for the English track – and you really should – then as mentioned above there are some short sequences that had to be sourced from the Italian version, and the language thus makes the odd temporary switch and subtitles pop up to provide the translation. It may be just an issue with the review disc, but on two occasions the sound and subtitles on the English track vanished completely for a few seconds. There are no such breaks on the Italian language and full English subtitle tracks. A fuzzy, artefact-ridden but intriguingly suggestive trailer that's preceded by a warning that it's been sourced from a low quality master and has been included for the sake of completeness. Full marks to Shameless for actually telling us this, and yes, I am still glad they included it. The last 26 seconds play over a blank screen. Oooo, what do you think that might mean, eh? The original opening credits for the English language version, which was also sourced from a low band master by the look of it. A far more dramatic sell than the theatrical trailer, one that assures us that "she knows she's marked for death!" and closes with the hastily barked information, "Starring Klaus Kinski!" Starring? I don't think so. A rolling gallery of slightly fuzzy promotional material, set to the title music. There's also the usual Shameless Trailer Reel, but this one has 20 trailers in it, and it's clearly these fellows that are responsible for that 18 rating. An atmospheric and well crafted mystery thriller with a solid central performance. Gore hounds be warned, this is not your standard Shameless release and certainly don't be fooled by that 18 rating on the box. But if your movie pleasures extend beyond the liberal dispensing of red, red krovvy, then Footprints certainly provides its share of understated pleasures.